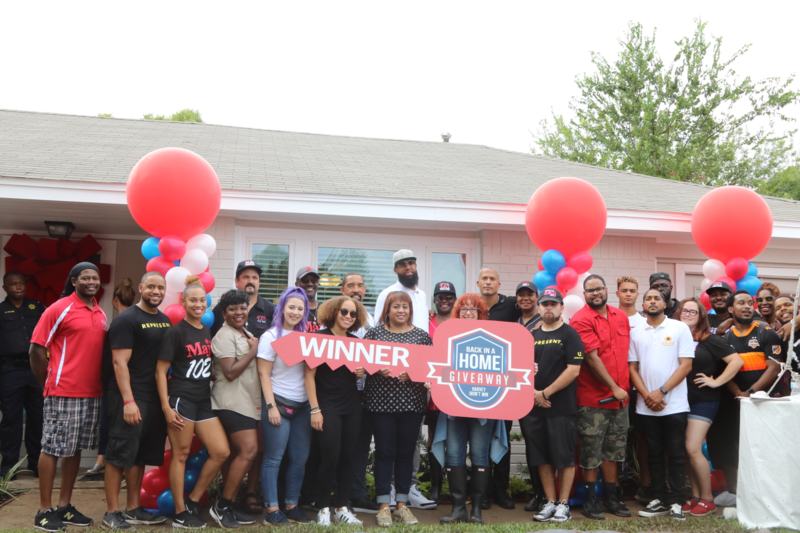 Slim Thug, with his company Boss Life Construction, IJustGotHit.com, and Radio One Houston stations: 97.9 The Box, 92.1 Radio Now, and Majic 102.1 partnered together this summer to give a little extra hope to those affected by Hurricane Harvey with a special Home Giveaway Contest. The #HarveyDidNotWin started on July 9th with announcements taking place on Radio One Houston stations and having listeners affected by Hurricane Harvey call in explaining their experience of losing a home due to the storm. The requirements were for previous homeowners to have lost their home due to complications with Hurricane Harvey. After receiving over 4,000 entries, the partners announced the 10 finalists on August 27, 2018, during a press conference held at Radio-One Houston. Several of the finalists and their families were able to share their stories on-air at all three Radio-One Houston stations. 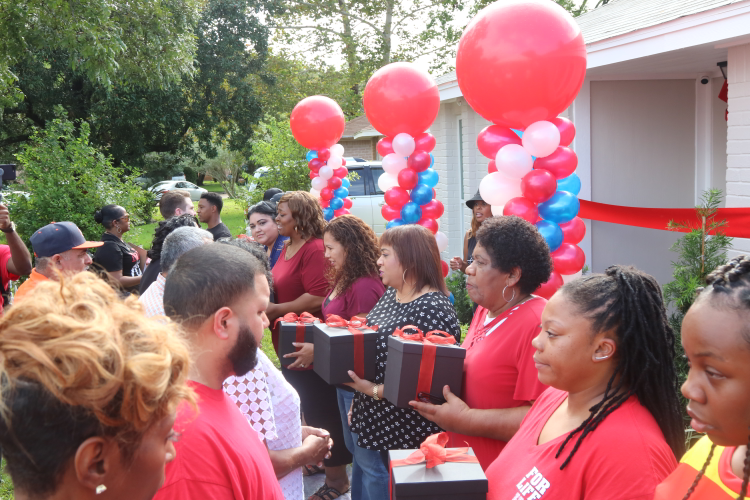 The morning of September 26, 2018, 10 finalists devastated by Hurricane Harvey and their families arrived on-site at the home which was fully remodeled by Slim Thug & Boss Life Construction. All of the finalists were greeted by radio personalities of Radio-One Houston where pictures were taken and the excitement was at an ultimate high. Congresswoman Sheila Jackson Lee called in from Washington D.C. to give her regards to each family and encourage them to continue to push forward during their process of rebuilding. 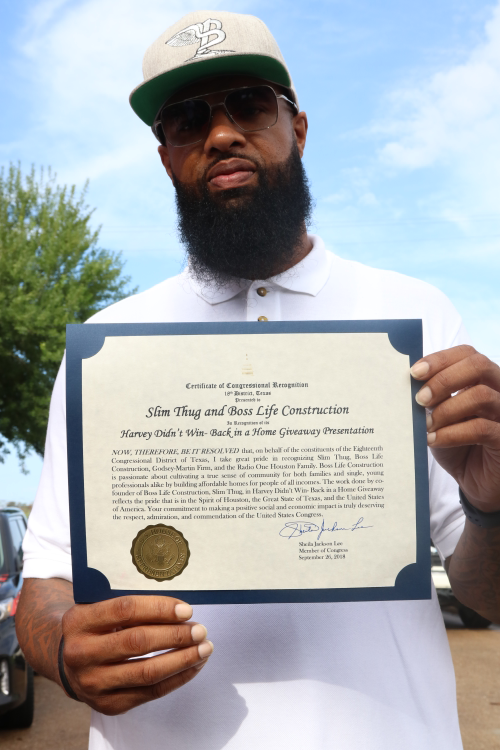 She also had a representative on-site to present a Certificate of Congressional Recognition to Slim Thug, Boss Life Construction, The Godsey Martin Foundation, and Radio-One Team. The program officially started with remarks from Justin Martin of Ijustgothit.com and ended with Slim Thug. “It’s a blessing to be a blessing! 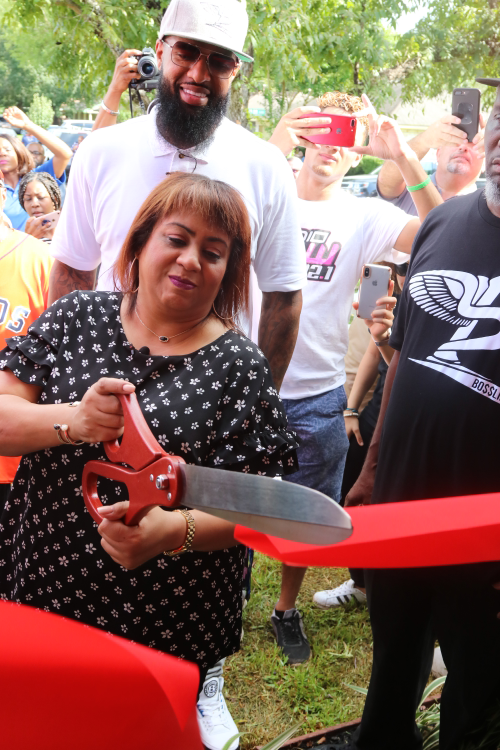 We were definitely excited to give the house a Boss Life touch and turn this Harvey tragedy into a blessing.” Slim Thug added. All 10 finalists were provided with a box which 9 of the boxes had $5,000 and one of the boxes had the key to the home. Prior to the countdown of unveiling their prizes, tears, cheering, and praying took place. Wendy Villalba revealed the lucky key to the home “Oh My! 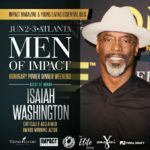 This is a blessing! I picked box 10 because my birthday is in October! I don’t even have words right now.” She expressed. Wendy was displaced from her home due to the hurricane and 2 weeks after Harvey she was placed in the hospital where she was in a medically induced coma and projected not to survive. After 3 months of being in the hospital fighting for her life, Wendy was released, but left with no place to stay. She has since been staying in an apartment with little to no furniture with her 2 children. At the top of October, Wendy will be able to move into a fully furnished house with her family. 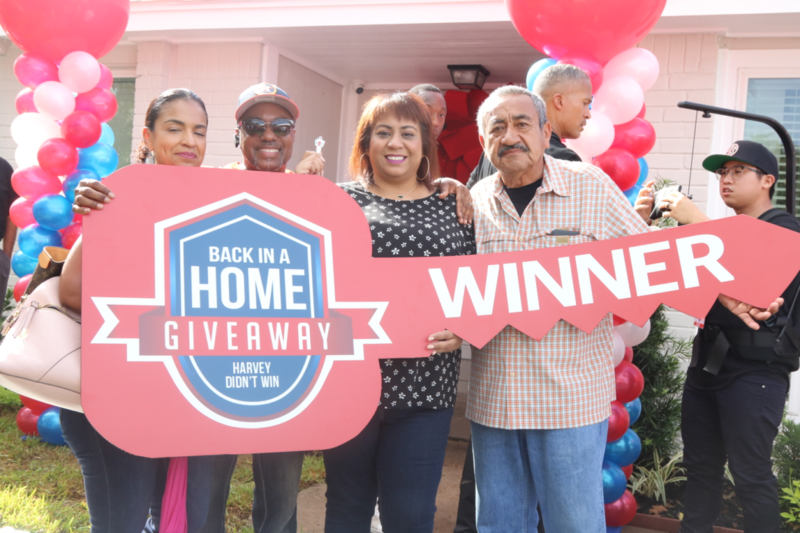 Contributors of the Harvey Home Giveaway: Boss Life Construction, Ijustgothit.com, Radio One, Alert 360, Ruben Reyes Furniture, Fence Geeks, Green Grass Irrigation, Decks By Delorean, and Camplex HTX-CCTV.